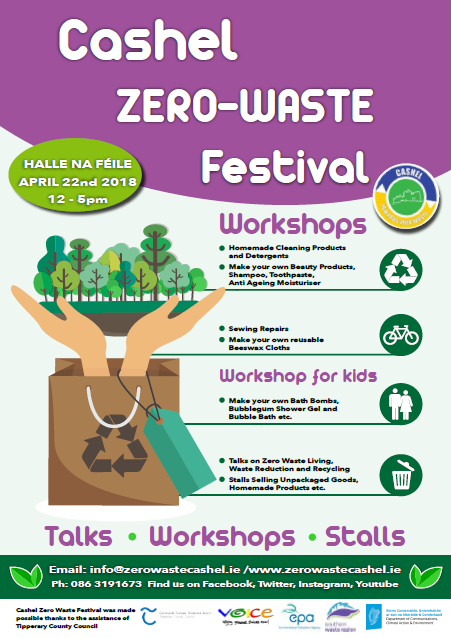 A Zero Waste Festival will be held in Cashel on Sunday April 22nd. The festival is being organised by Zero Waste Cashel. April 22nd is also international Earth Day, whose theme this year is ‘End Plastic Pollution’. The one day Zero Waste Festival is being held in Halla Na Féile, Cashel and runs from 12 to 5pm. There will be a number of talks and workshops aimed at helping you manage and reduce your waste and save money at the same time. Workshops vary from learning how to make your own non toxic household cleaning products and detergents, to beauty products, to reusable beeswax cloth wraps. Attendees will also be able to find out for sure what goes in the recycling bin and learn simple strategies on how to effectively reduce their waste with the VOICE Recycling Ambassador Programme. There will be number of stalls where you can buy package free goods such as loose nuts, seeds, herbs, spices, pulses, grains, coffee, tea etc. along with homemade products like soap and cleaning products. Be sure to bring your own bags and containers so you can fully experience real zero waste shopping! Inspired by the successful festivals run by Zero Waste Festival Ireland, we hope to bring the same experience to the people of Cashel. There will also be children’s entertainment, so the whole family can come along. More information can be found on www.zerowastecashel.ie and there will be regular updates on the Zero Waste Cashel Facebook page. The festival has been made possible thanks to support from Tipperary County Council under the Festivals and Events Grant Scheme 2018.